Al-Worod Al-Dania ES Co. - meteorology - Al-Worod Al-Dania ES Co. The weather stations supplied by our company are known for precision measurement capability, rugged construction, wide operating temperature range, low power consumption, and have flexibility to easily change sensor configurations, data processing, and data storage and retrieval options with a high grade and efficient software. The pre-configured weather stations offer research-grade performance coupled with ease-of-use for weather and climate monitoring. The agro met measurement systems are used extensively in agricultural applications for both day-to-day and research purposes. For classical meteorological equipment, we supply a range of traditional manually read instrumentation for the measurement of surface meteorological parameters, a comprehensive range of precipitation measuring instruments from simple manual rainfall collection devices, electronic tipping bucket rain gauge sensors, through to fully autonomic stand alone data logging systems with telemetry for hydrological network applications. ˃ Preconfigured and custom automatic weather stations AWS which may be operate individually or in networks. ˃ Communications options include phone, cell phone, voice-synthesized phone, satellite (DCP), and radio. 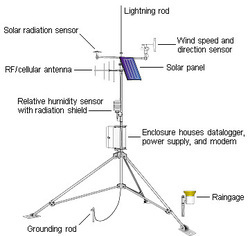 ˃ Stations can measure most commercially available meteorological sensors. ˃ Batteries and solar panels allow long-term, remote operation. ˃ Pre-programmed stations calculate potential evapotranspiration ETo, weather parameters and soil moisture, and can be used for different applications as: irrigation scheduling, heat/chill monitoring, integrated pest management, pesticide and fertilizer application, frost prediction. ˃ Agro met stations measure nearly every commercially available soil sensor, including tensiometers, heat flux plates, thermocouples, psychrometers, lysimeters, and gypsum blocks. ˃ AWS measure air temperature, relative humidity, wind speed and direction, precipitation, atmospheric pressure, solar radiation, and other variables. ˃ Classical weather & climate stations. Ø Sensors · Wind speed. · Wind direction. · Solar radiation. · Temperature (air, water, soil) · Relative humidity. · Precipitation. · Snow depth. · Barometric pressure. · Soil moisture. · Fuel moisture.